St. Patrick’s Day is coming up quick — so what are you giving the Irish person in your life? How about a gift that lasts a lifetime, and will benefit not only the direct recipient, but millions of kids? 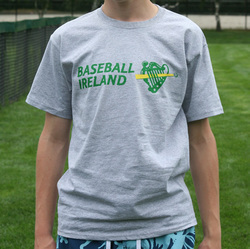 Donate $35 to the Field O’ Dreams fund raiser and you will get this official T-shirt of the Irish National Baseball team — the ideal gift for the Irish person who has everything (you can’t buy this shirt anywhere else). In addition to the shirt, you also get the satisfaction of knowing you are a part of history — your donation goes toward the building of the first-ever baseball stadium in Ireland.